US President Donald Trump said in one of his recent tweets that Obamacare was on its last legs. 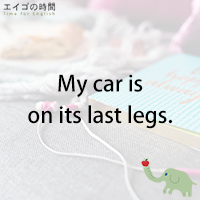 Are you familiar with the expression? If something is on its last legs, it’s in such bad condition that it will soon be unable to work as it’s supposed to. Let’s say, your car just hit 200,000 miles. It’s obviously on its last legs. This phrase can be used for something that is not tangible like cars and phones. For example, your marriage is on its last legs. You’re leaving your husband or your wife is leaving you. Likewise, a person who is extremely tired especially after a lot of physical activity, or who is going to die very soon, is also on their last legs. For example, you’ve just done fifteen miles and you’re on your last legs. Now. Would you like to try a quiz? You’ll be given three options. Please listen carefully and choose the one that is TRUE. Ready?